PHOENIX (BP) – Presidents of the Southern Baptist Convention’s six seminaries noted growth in ministry, enrollment and financial support in their reports to messengers June 14 at the SBC annual meeting in Phoenix, including Jason Allen of Midwestern Baptist Theological Seminary in Kansas City. 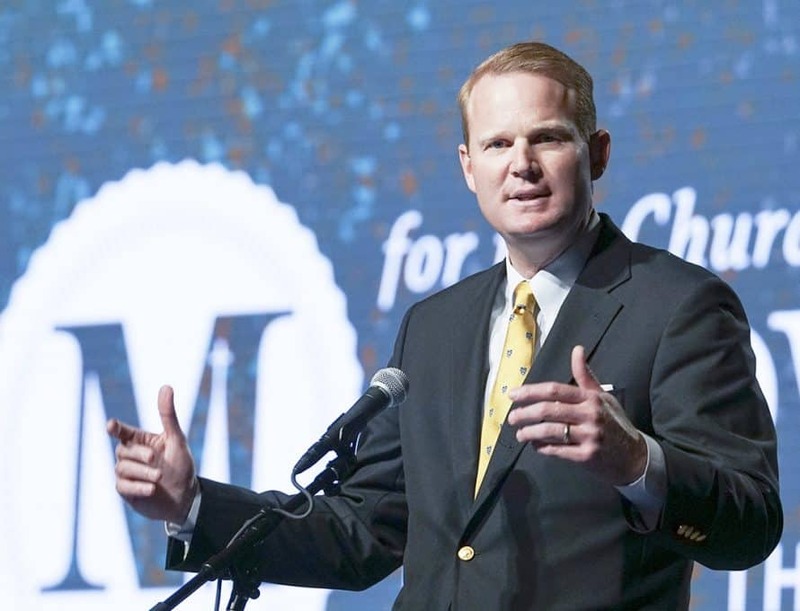 Allen’s report to the messengers at the 2017 Southern Baptist Convention annual meeting reflected on God’s goodness to the institution over his now nearly five-year tenure in Kansas City. Midwestern’s enrollment stood at 1,200 students approximately five years ago, he noted; now, the seminary is about to surpass the 3,000 mark. Allen noted a key reason for the marked increase: “I believe it goes back to three words: For the Church. Not only is the quantity of students remarkable, Allen said, but the quality of students coming to Kansas City is impressive as well. Students are arriving on campus with a drive and motivation to serve the local church – both locally and internationally, he said, noting that it bodes well for the future. Allen also reported that God has blessed the seminary through financial support, with nearly $20 million in gifts and pledges having been given over the past four years, which is more than all the support raised from 1957 until 2012 combined. Updating the messengers, Allen said that construction is underway toward a 40,000-square-foot student center that will include a gymnasium, cafeteria, bookstore, café, seminar space and workout facilities. The planned completion date is June 1, 2018, and thanks to the generosity of the Mathena family of Oklahoma City and many others, the construction will be accomplished with no long-term debt. Allen further noted the seminary’s strong financial position is paying dividends for incoming and existing students, “The financial strength that God has blessed us with through generous contributions and enrollment growth, we are especially using to keep tuition low so that those who come to study at Midwestern Seminary can graduate unencumbered by debt. Concluding his report, Allen spoke of two new initiatives taking place at Midwestern Seminary, and praised one existing program. Allen explained the Timothy Track M.Div., which pairs incoming M.Div. students with Kansas City-area churches in internships. The program provides these students with personal, hands-on mentorship opportunities with Southern Baptist pastors and also enables them to exercise their spiritual gifts while in seminary. Allen added that those participating in the program can earn a 50-percent scholarship. Allen also noted The Residency Ph.D. track, which is especially geared for those who sense a calling into Christian theological higher education. This track, for those who study in residence, will offer special classes and mentorship opportunities with faculty and guest lecturers, so they can obtain the best preparation possible to serve in Christian seminaries and colleges and prepare the next generation of pastors and ministry leaders.